The kitchen is usually the heart of the home. People tend to gather where the food is. 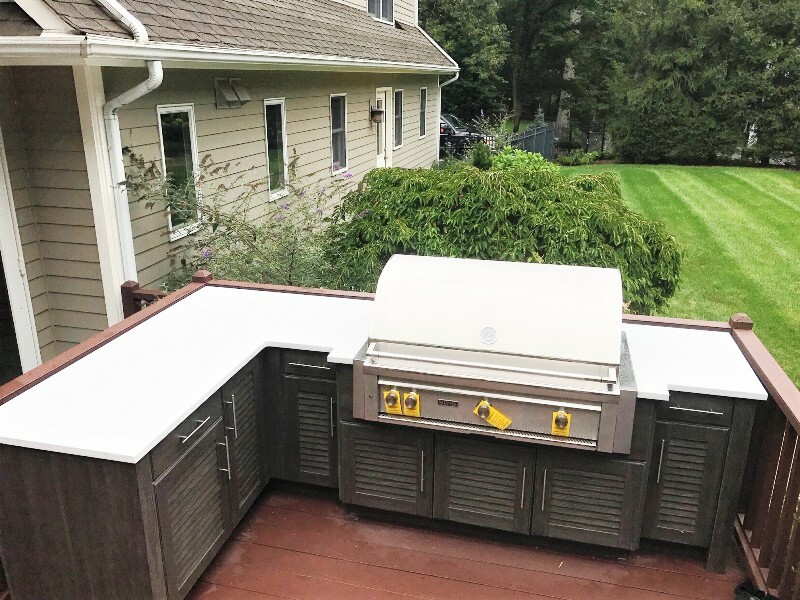 The design of the kitchen is therefore very important, and perhaps this explains the growing trend in outdoor kitchens designed to be an extension of the house’s interior. When designing an outdoor space that integrates with the indoors, there are three basic categories that are most important. If the outdoor kitchen is to be an extension of the indoor kitchen, then designers need to maintain a consistent style between the two. Often this means giving an indoor look to the outdoor kitchen. For instance, there is a growing demand for cabinets with flat door styles, a contemporary trend more often associated with indoor cabinetry. The overall look is more and more about clean lines and simplicity. Designers are achieving a high-end, modern aesthetic with natural materials like wood and concrete, but paired with stainless steel appliances. White marble is a classic look that continues to be popular and is even gaining in popularity. Along with a consistent style, clients value a smooth transition between indoor and outdoor. They want convenient access to every part of their kitchen. One way designers can accomplish this is with retractable walls. They make the barrier between indoor and outdoor less strictly defined, while allowing for the protection of appliances from the elements when the weather is bad. As people spend more and more time outdoors, it is becoming more common to use the kitchen as the connection to the outdoor space, where traditionally it had been the living room. A good designer can get the most from even a small space, but by integrating indoor with outdoor, clients can get more out of their kitchen spaces, even with small floor plans. This allows them more freedom to choose cabinets and cooking appliances without having to force them into the space. With smaller spaces, the focus in a kitchen is more on the grill and the refrigerator. With the integration of indoor and outdoor space, there is more room for the other amenities of a kitchen. The main difference between outdoor and indoor amenities is the materials they are made from. This is especially important the farther north you go. Clients increasingly want what they have inside to go outside, but designers first have to make sure their cabinets and appliances will withstand Mother Nature. The best outdoor materials are high-quality but low-maintenance. They must stand up to bad weather and last for a long time. This can, at times, restrict what clients can put in their outdoor space. Automatic opening drawers, for example, are made with non-stainless metals and therefore are a poor choice for an outdoor kitchen. When all is said and done, the client is still the one calling the shots. Whatever the trends, design preference is still the customer’s prerogative. Everyone has their own style and goals for their outdoor kitchen, and designers are keeping this in mind. From bold to muted colors, or smooth to grainier textures, designers keep everything on hand because each client has his or her own goals for what they want their outdoor experience to be. The client conveys to the designer what they want, and the designer’s job is to bring that dream to life.